I purchased the digital version of Haynes RR/R/XR workshop manual last night and after reading through most of it, its got the tick of approval. Before you ask, no I wont be uploading copies for others to download - its only $30 AUD don't be such a cheap skate and support the people who put in the hard work to make these documents! Before I give you my professional opinions, a little about me - 30 years in the automotive industry, 15 of those working for OEMs in a technical support or technical training capacity - I've seen my fair share of workshop manuals (even written them) and worked with the OEM technical resources for a long time. The images used to illustrate the procedures are very clear and can be enlarged to higher resolution. All the important fasteners are highlighted and the producers have taken the time to show all of the hard-to-reach fasteners, making it easy to follow each procedure. Compared to the vague images and line drawings used in the BMW manual, these are fantastic. Whenever another section needs to be referenced in the completion of a task, the section is hyperlinked. Throughout the manual, alternative methods are shown to negate the requirements for BMW special service tools. Whenever there is no other alternative, the manual provides part numbers for the BMW special service tools. Further to this, whenever BMW scantool programming is required (i.e. gauge cluster replacement), directions are provided. For every section, specifications and a detailed system description provided, along with installation, inspection and reassembly hints. It is clear that the person who wrote this manual has also performed all of the procedures themselves. 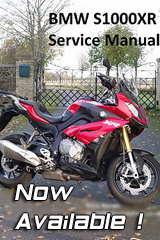 Information in the General Info and Reference sections, whilst mainly generic to all motorcycle maintenance and repairs, has been contextualised to the BMW product wherever possible and provides over 100 extra pages of great resources. Printing is encouraged - so you can print the pages you need and not mess up your nice hard copy book... or you can print to PDF and save an 'offline' copy for quick reference. Although the wiring diagrams provide pin numbers and wiring colours, they have no connector information or component locations. Furthermore, there is no legend to show what the symbols mean - making it difficult for a less experienced navigator to track down the wires they are about to test. There are no exploded view diagrams provided, showing how a component is assembled or structured - however this can be found easily in the parts fische on Max BMW's website. Although reference is made to OBD scanners and the Hextool, there is no information on Diagnostic Trouble Codes (DTC). DTC's are normally generic and it wouldn't be that hard to list the meaning for each code, provide a general description and list the possible causes for each code. All in all, its worth the money and I would be confident using the manual to carry out an oil change or an engine rebuild - and everything in between. Nice write up Patrick. I'll be needing a manual soon. It's almost time for my 6000 mile service. Thanks for the review. I bought the "written" Haynes manual...found it to be similar to the digital version as Pat says...quite good for a Haynes. The Digital version would be my choice. as you can print off the relevant pages required. Rather than try to print them from the book version. Or have the book balanced whilst trying to read the info. Excellent post. I also have Marks Manual, and to be honest they complement each other. 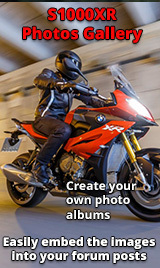 Marks manual has been written and illustrated by somebody who has actually worked on the bike, and so it gives an excellent overview of how to go about general upkeep. So its still a great manual to have. I would say if you are not into major mechanical repairs then Marks manual is more than adequate. If you are into stripping down the engine and complete rebuilds then you will require the Haynes. I see in North America its a subscription based model ($29.95 per year). Is it the same in the UK/rest of world? I would enjoy an online/electronic version, but having to pay yearly is not something I am interested in. Yes the same here in the UK £16.99 per year subscription. As I have said if you only want a regular maintenance Manual then Marks is really good. BMW do a digital Manual its a one off payment and they describe it as a workshop manual. But I do not know how good it is. Eric, once you have saved the manual to PDF, you don't need to keep paying for the online subscription.